American poker pro Robert Mizrachi has done it again. After entering Event #3 of the 2015 World Series of Poker, $1,500 Omaha Hi-Low Split 8 or Better, Mizrachi outlasted a field of 918 to lay claim to his third WSOP bracelet, and a quarter of a million in prize money. Robert Mizrachi defeated fellow America Jacob Dahl yesterday afternoon in a final table, heads-up battle to scoop his third bracelet and the 1st place prize of $251,022. The two spent nearly 2 hours tossing chips back and forth before Dahl’s well of luck finally ran dry. As the two prepared to duke it out for first on Sunday, Jacob Dahl was in hot pursuit of his first major poker title. He had Mizrachi out-chipped 5 million to 1.8 million when the action resumed for the final Day 4 action at 3:00pm. But in typical Mizrachi fashion, Robert calculated every decision carefully, wearing away at Dahl’s lead, and confidence, bit by bit until the tides eventually rose in his favor. Things didn’t look good for Robert Mizrachi early on though. Not only was he battling a head cold, he put himself all-in on two occasions that could have seen his day cut very short. Instead, both hands ended in a split pot, keeping him alive long enough to perform yet another epic comeback win. On what would become the final hand of 2015 WSOP Event #3, Dahl raised from the button, inciting a 3-bet from Mizrachi. Looking down at Qh-8h-6c-3s, Dahl shipped his remaining chips. Mizrachi was quick to call, showing As-6h-5h-5d. A trio of clubs fell on the flop, delivering 10c-7c-2c. One more club could have extended Dahl’s day, but the dealer completed the board with a 10d turn and 3d river. Robert Mizrachi easily won the Low hand with A-2-3-5-7, while his 2-pair, 10’s over 5’s, dominated the High hand. The title dream of Jacob Dahl, who’s earned just over $25,000 in live poker events since 2009, came to an abrupt halt. He did, however, collect the largest cash of his career by far, $155,333, for the 2nd place finish. 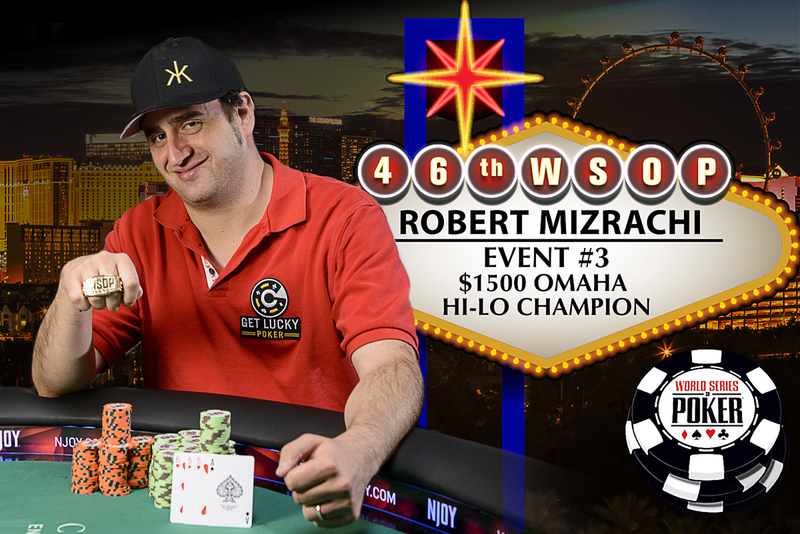 Robert Mizrachi added $215,022 to an impressive, 15-year career total of $5,437,135. The 36 year old veteran of the felt has been playing poker professionally since the early 2000’s, having cashed in 35 WSOP events since 2003. Three of those cashes were first place finishes, worthy of bracelets, tying the 3 bracelet wins of his younger brother, Michael “The Grinder” Mizrachi. Amazingly, he is the first of four brothers who’ve all seen success playing poker. In 2007, Robert Mizrachi won his first WSOP bracelet by taking down the $10k World Championship Pot Limit Omaha event for $768,889. He followed that up with a bracelet win at the inaugural 2014 Dealer’s Choice event, worth $147,092. By then, his brother Michael already had 3 bracelets to his name, but yesterday’s triumph brought the two back to a dead heat. Robert’s twin brother, Eric Mizrachi, has cashed for over $242k in live events, but his closest grasp on a WSOP bracelet was a 43rd place finish in a 2009 $1k NLHE event. His youngest brother, Donny Mizrachi, is a professional magician with three WSOP cashes worth $41,314, but no near-bracelet finishes.